Still kicking myself over a purchase I didn’t make | Where to next? For quite a few years, Poor John has played a stern devil’s advocate every time I start looking seriously at travel souvenirs. And where do you plan to put that, he says. And what will you get rid of in exchange? 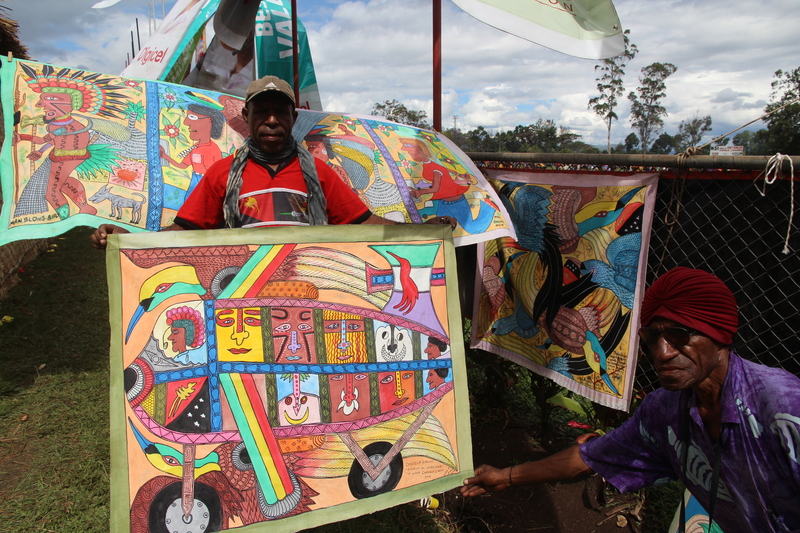 So I was rather surprised when we cruised through the craft area at the Goroka Show, and he actually encouraged me to buy a couple of somethings. We dithered for quite awhile over several paintings and, in the end, bought one showing a planeload of tribesmen all dressed up and heading to the show. My dad was a pilot and I’m rather partial to airplane art. I was pleased to purchase the painting direct from the artist, Simon G, and get a picture of him with his handiwork. He also told me the names of all the tribes shown in the plane windows—see the caption for the details. Bilums were next on the list. 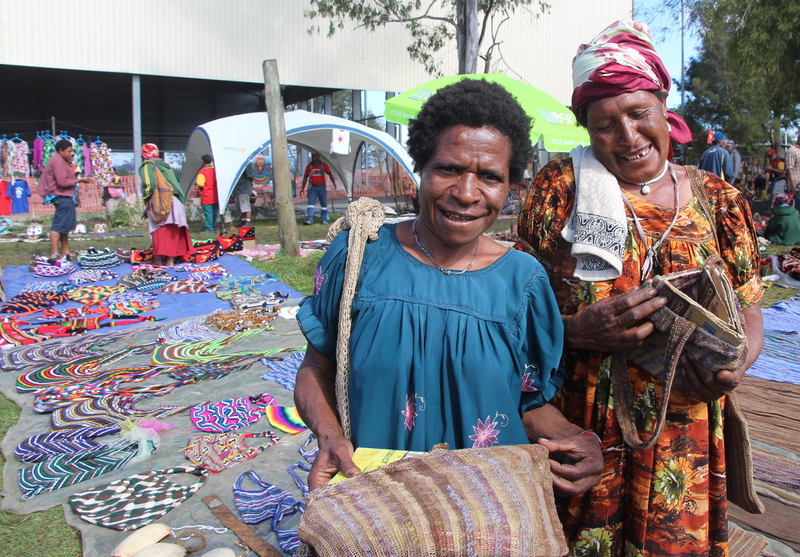 Everyone in Papua New Guinea carries one of these handy woven bags. I bought several made of bark, which is often called bush rope. Coffee was our next hit. Poor John really, really loves his coffee. He’s an addict in the extreme. At the moment, we have at least nine different varieties of coffee beans in our house—and some inferior instant stuff. 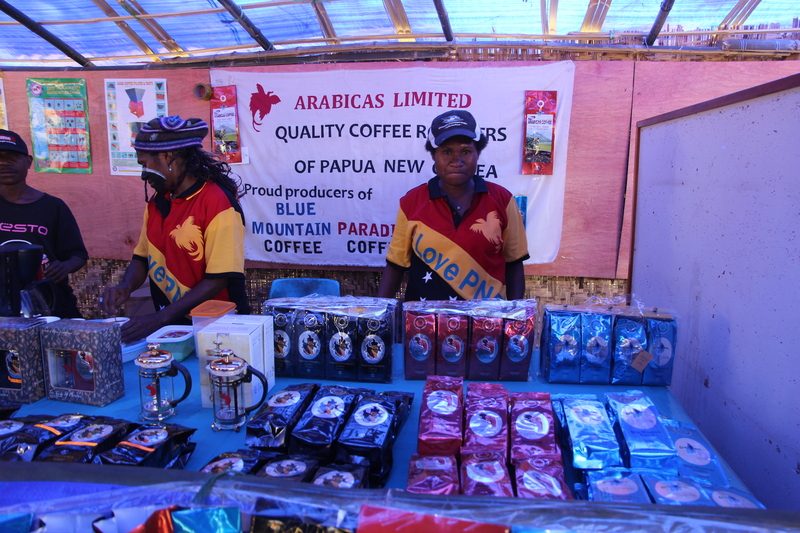 We visited the coffee tents several times and tried to order two kilos of coffee beans. On the last day of the show, the sellers were most apologetic about not being able to fulfil our order. But then there was the mask. Normally I avoid masks, but this one was so amazing and so detailed and so lovingly made. And probably so out-of-bounds for Australia’s quarantine laws. Luckily, this one wasn’t made with any hair products, but I was still wary. Poor John said, Go ahead and buy it. I’m sure it can be treated. The artist—I never got his name—said it took him a year to make and he wanted 250 kina or just over $100. But I foolishly said, No, no. I wasn’t so much concerned about quarantine, but more thinking that he should sell it to someone who doesn’t have a houseful of weird artefacts. Imagine my dismay on day two of the show, when we went back to the craft area to see if the mask was still there. It was gone. 😦 I asked the artist was he got for it. The customer had ‘beaten him down’ to a mere 100 kina. He didn’t look very happy about that. Now that’s the crime. A guy works for a year on a work of art and gets less than a measly $50. Even if it had been taken off me at quarantine in Australia, I wish I’d bought it for 250 kina. At least the fellow would have had some decent recognition and compensation for his labour of love. And I might have ended up with an amazing mask somewhere in my house. I still don’t know where I would have put it, but don’t tell Poor John. He encouraged me to buy it, but never asked where I’d put it. Maybe he’s sorrier than I am. I love the art you bought. Just up my alley, supper colorful and fun. I knew you’d love it! 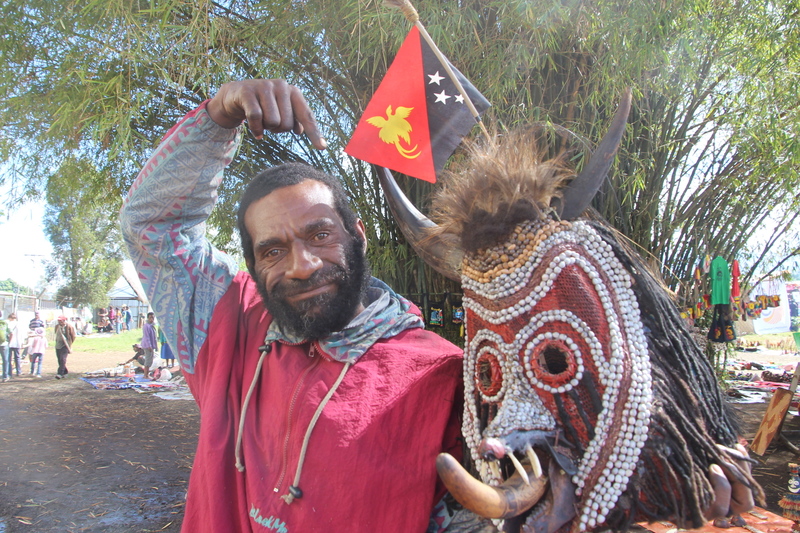 You’d love the whole Goroka Show. Mind boggling! I love bargains, but I hate to see an artist’s work be so undervalued. Definitely won’t fit in the dunny! You’re sure right about that. Maybe I could have hung it from the ceiling—like a lampshade. I’m kinda shocked that I’m the first person to comment on the first picture used in this blog post. The guy on the right is either actually Bill Cosby or just related to Bill Cosby. When I read, “Tried to order two kilos of coffee beans.” This is actually what I thought about in my head. Leggypeggy: I would like two kilos of coffee beans please. Shop Keeper: You would like two kilos of coffee? Leggypeggy: Yeah, that is right. That’s what I’m after. Whats the score here? Shop Keeper: Your looking for two kilos of coffee? (Pause) Well let me ask you this. How do you plan on getting it over the border? Great post and wonderful pictures! He does look a bit like Cosby. And although he’s not smiling here, he did have a beautiful smile. His paintings are on the left behind Simon. As for the coffee, it is one of the things we can easily bring in to Australia. I think you could have worn the mask and scared your way back into Australia! Or you could have mailed it to me for safe storage until such a time you were ready to collect it or I could have mailed it to you as a gift that I’d bought for you from a site of your choosing. Thanks for the suggestions. If only I’d thought of these when I was standing in front of the mask! Oh gosh, I could have hung it at the front door on Halloween. Silly me. But any sign would have to say ‘Beware the rowdy schnauzer’. I would bring the half world home, if I could! That’s a problem! Thanks Kenny. Some of the sights took away my breath too. What a show! Dave, now why didn’t I think of that? 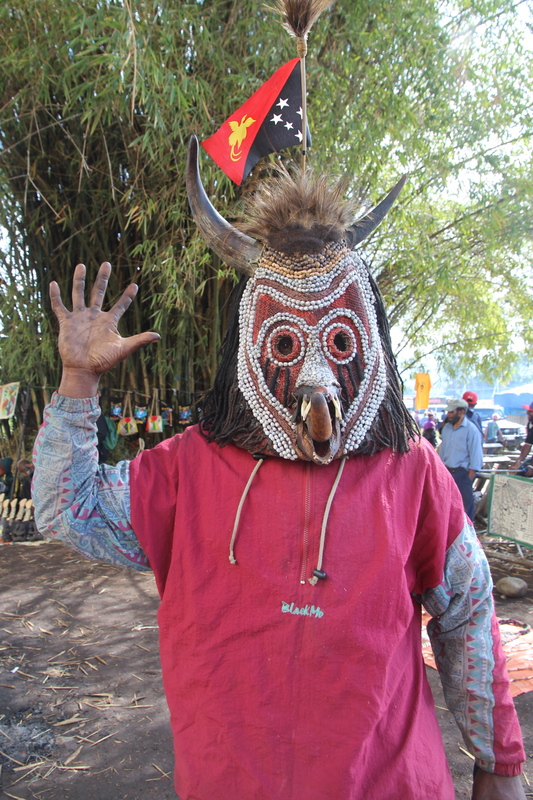 Plants are just as showy as costumes at the Goroka Show | Where to next? 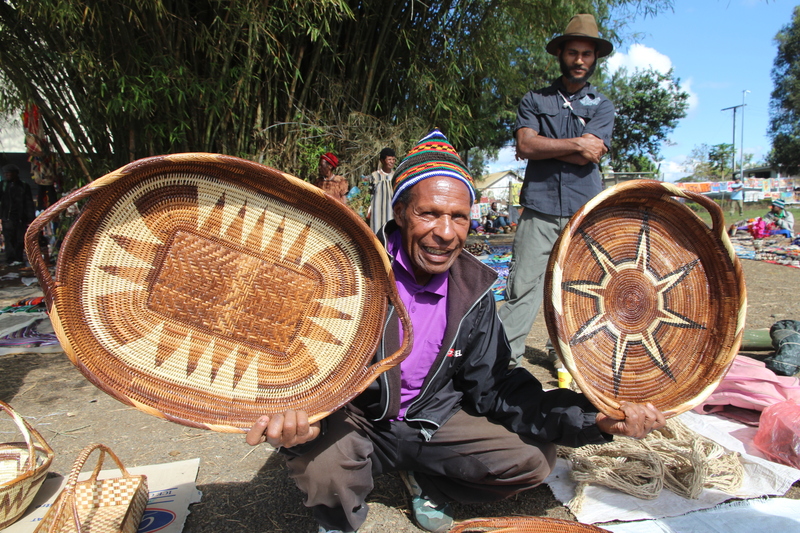 No skirting around the Goroka Show—it’s all upfront | Where to next? Loving and living with art—and lots of it | Where to next?